Lab Report: Trapster : Cop and Mouse Game with Speed Traps. Trapster : Cop and Mouse Game with Speed Traps. As a Mobile App enthusiast I try out a lot of app. I love to believe that I have seen all possible use cases of mobile phone and most of the time I am right but once in a while I come across an app which make me say "Damn ! 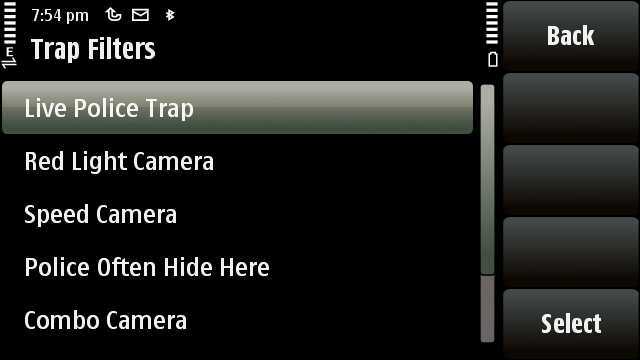 How come I never thought of it " .Trapster is one such app . Its an perfect example of how community collaboration,location info and real time connectivity offered by Mobile phone can be used for the purpose of handling a situation we all face . Idea behind Trapster is straightforward .It helps you to avoid speeding tickets by detecting and warning you about traffic cops,speed sensors,red light cameras,check points and mobile police patrol units when you are driving . Some of you who drive on highway might be familiar with the practice of blinking side light and waving hand by drivers ahead of us to warn drivers following them about an upcoming obstacle. Trapster solve this problem in more elegant and systematic manner. Trapster call itself as a speed-trap sharing social network. its modus operand is simple: All you need to do is to simply install Trapster app on your Nokia device (OVI link) and register. Now Let's say I am cruising along on highway with my Trapster enabled phone. Trapster app captures my location and shows me the speed trap along the way . These speed traps are displayed as marker icons on a map interface. As I approach a Speed trap (say a speed camera ,red light camera or hidden traffic cop) . I get a voice alert through application .These speed traps are stored in Trapster database in a Geo tagged fashion . This data base is continuously updated by contribution of Trapster community . You can add a new Speed trap by simply taping on touch screenof your device when you drive past it .Trapster offer you choice of category to represent the nature of trap.Once you select the icon, That place is tagged with a an icon indicating the kind of threat you may face. you can also add a speed trap by calling an IVR Line . Trpaster's analytic engine validate the input using its validation heuristic like how many of other user have spotted it and your past contribution history. You can see a video demonstration of service here. Trapster offer an excellent UI and Granular classification of data . There are 4 types of map view,7 type of Trap category,you can set a threshold distance on which you want to be warned about an upcoming obstacle.you can also define the method of alert (sound ,Visual,Vibrate). so much so that you can also choose the sound theme (your choice include Bill Clinton ,George Bush ,NY Taxi Driver and Spanish among many other) .Best thing about Trapster is that it doesn't sacrifice ease of use for granularity . Screens are neat and well designed,Work flows are cognitively consistent. User interface and accuracy aside , much of the success of such a product depend on the community factor. how actively the community participate in creating and maintaining the database of Speedtrap . Now one might think that it will be an Herculean task to populate such database you might need a huge base of active contributors . well not really.According to Trapster CEO only 10 active users can effectively cover major urban roads and 40% of Trapster users actively provide trap reports and validate the reports submitted by others this creates a self feeding and self correcting loop. I was surprised to see that their database had significant marker for Delhi NCR in spite of them not having any dedicated Indian presence . that's the testimony of scalability of their model. One might argue that Trapster is a product on slippery slope of law. You are essentially trying to help people who want to dodge law enforcement agencies.Well Your argument will have some grain of truth but you will be surprised to know that trapster has found a champion amongst most unlikely of profession . Traffic Cops.Trapster has officially partnered with traffic cops at Travis county. you can read about it here. Do try out Trapster and let me know your thoughts . We request you to keep your comment relevant to the discussion and avoid making personal remark.